Stormwater runoff is rain that falls on streets, parking areas, sports fields, gravel lots, rooftops and other developed land. This rain picks up and mixes with what’s on the ground such as Oil, grease, metals, coolants, fertilizers, pesticides, bacteria from pet wastes and failing septic systems, soil from construction sites, soaps from car or equipment washing, accidental spills and whatever else ends up on the ground. This polluted runoff then rushes into nearby gutters and storm drains and into streams, lakes, rivers, and bays. 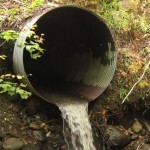 In most areas, stormwater runoff enters these waters without being cleaned of pollutants. Street sweeping and catch basin cleaning are two common best management practices (BMPs). But there are ways you and I can help. 1. Never dump anything down storm drains or into streams and report anyone who does. 2. Select native or adapted plants that require less water, fertilizer, and pesticides. 3. Apply lawn chemicals according to the label and do not over apply chemicals and never apply before a heavy rain event. 4. Keep grass clippings and other yard waste out of street gutters and storm drains. Drains blocked by excessive debris could cause flooding. Compost clippings or mulch mow instead. 5. Dispose of used motor oil, paint, and other household chemicals properly through the City’s household hazardous waste collection program. 6. Do not dispose of used cooking oil by dumping it outside or in a storm drain. 7. Take your car to a commercial car wash facility. Washing cars on driveways or streets will result in the cleaning products flowing directly into storm drains. 8. Pick up your pet’s waste. Pet waste can carry harmful bacteria and parasites. 9. Have your septic tank pumped and inspect your system regularly. 10. Don’t litter. Put trash in its place.